- What do the SEC whistleblower rules really mean? - What compliance policies and procedures must be considered to address whistleblowers? - How will the whistleblower rules affect internal investigations? 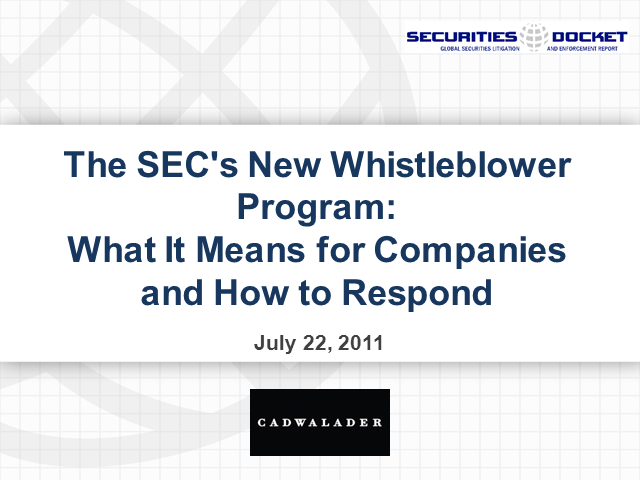 - What will the whistleblower rules mean for SEC Enforcement actions? For this highly informative webcast we have all-star panel with representatives from the SEC, corporate America, and private law practice. This is a must attend program for in-house legal and compliance professionals, executives and managers, and practicing lawyers who deal with compliance or will be involved in creating their organization's whistleblower policies.